I spotted an interesting offer tonight! 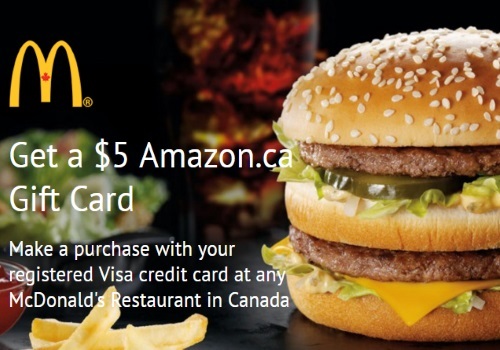 Get a Free $5 Amazon.ca gift card when you make a purchase with a registered Visa credit card at any Mcdonalds restaurant in Canada. Please note, qualifying purchase must be made by May 2, 2016. TrialPay will email you confirmation of your registration. Your Amazon.ca Gift Card will be emailed to you after your in-store purchase has been confirmed. Offer valid at McDonald's Canada retail locations only. Qualifying purchase excludes gift cards. Offer may change or end at any time without notice (except in Quebec). Limit 1 per card.